If done every practice for 10-15 minutes, these drills can really make a difference in your team's ball-handling and dribbling skills by the end of the season. These skills are the foundation for many of the offensive moves that the player makes with the ball. (See Diagram A) Players pair up along the sideline, and spread out. The first player in each pair dribbles from sideline to sideline right-handed, and then back left-handed. The coach will call out which move he/she wants them to execute at the half way point going across (right-handed), and then again coming back (left-handed). The ball is then passed to the partner, who goes next. 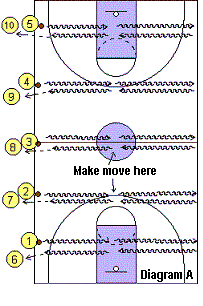 Have each player do each of the moves down and back twice before moving onto the next move. Below are the moves you should work on. You may vary these from day to day. But have them try even the difficult moves... challenge them... even if the ball does end up rolling all over the place! See: Dribbling and the video clips of these dribble moves. (See Diagram B) Use the same sideline setup as above with partners, or run your entire team, sideline to sideline with this drill. The players again dribble across right-handed. When reaching about 1/3 across, blow the whistle and they stationary "stutter" dribble with legs pistoning up and down and pounding the dribble hard and low, the player bent over forward at the waist with knees bent. After five seconds whistle again, and they resume dribbling across. When they reach 2/3 across, whistle again and they stationary "stutter" dribble again. Whistle again and they finish across. They pivot and come back, now with the left hand, doing their stutter dribbles at the 1/3 and 2/3 marks again. After doing this drill a few times, you won't have to blow the whistle... the kids will know where to stop and stutter, and know to stutter for a 5-count before going again.